Wax bottles candy also called Nik L Nips. Remember these wax bottles candy you ate as kid? Little bottle filled with colored juice. Each wax drink bottle is individually wrapped making them perfect for party favors. Drink the juice chew the wax, it's like getting two treats in one. 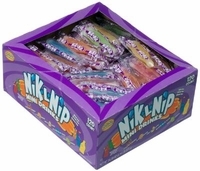 Each box has 120 individually wrapped nik l nips wax bottle per box.